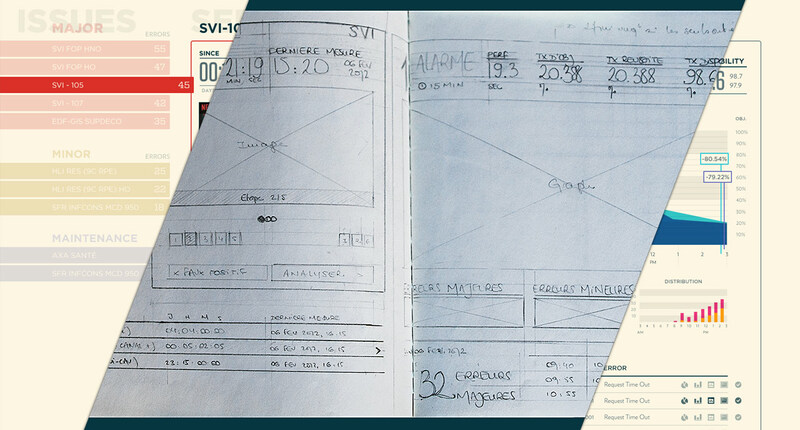 Witbe has powerful monitoring tools, from traffic, to bandwith, to UX, all around France and Europe. They are leaders on their market with clients like TV channels, ISPs, stores, banks, etc. However, developing a branded and a specifically tailored dashboard for each new client, and maintaining it, cost them resources and money. 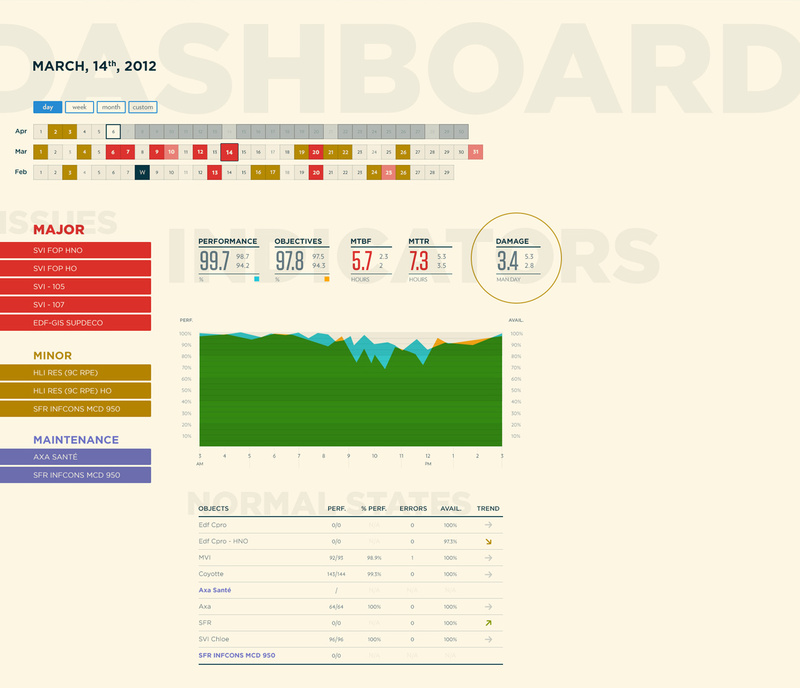 They requested to redesign an in-house user-friendly dashboard. After researching, sketching, and reviewing technical possibilities, we decided to create a unique interface for 3 different targets and usage, leading to a flat design drilldown that focuses on data and meaningful graphics. 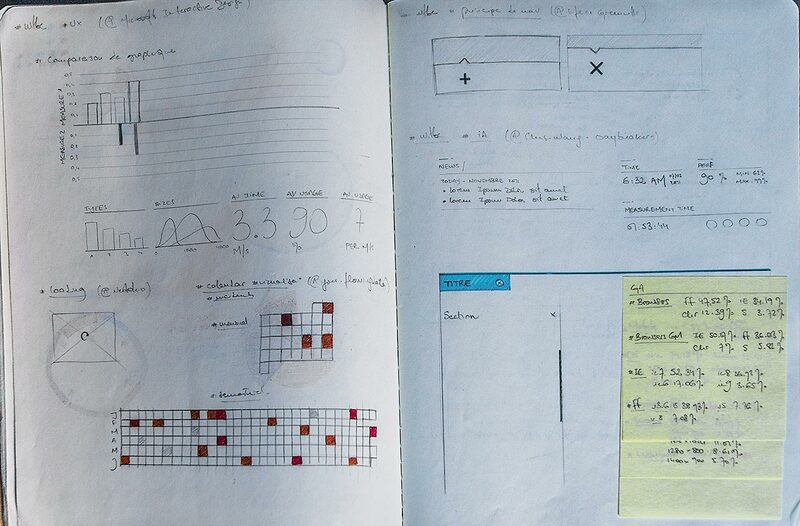 We prototyped directly into the browser in low fidelity. Despite a warm welcome, Witbe had to shut the project down, due to financial restrictions. In 2005, Livnat et al, from the University of Utah, discussed a new way of visualizing data for situation awareness. Their methodology emphasizes the importance to having access to the right information (what) at the right time (when) in the right location (where), during a crisis/emergency situation. 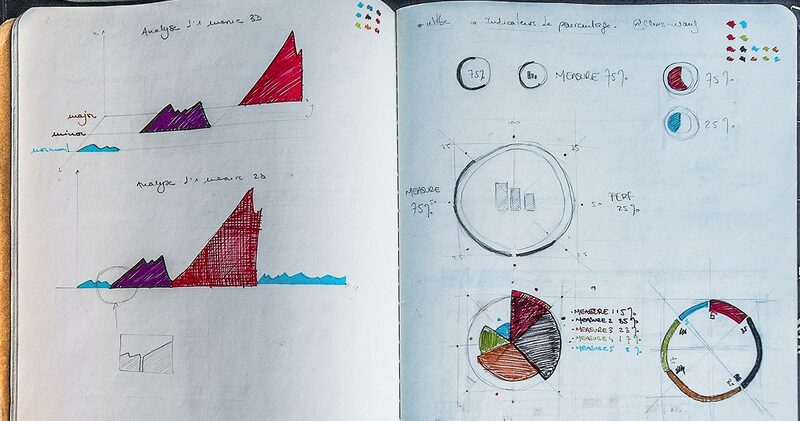 We advocated for more data visualization, less tables. More dynamic in-depth graphs, less static data. We suggested to use drill down to balance the use/need of tables. Network alert incident reporting, from Livnat et al. study. In their research on Cognitive Load, Sweller and al. (1998) described the salient role of information architecture and white space in cognitive processing of an unknown data. The difficulty of presentation induces a longer time to understand and use the new information. We used priority accent colors and contrast, alongside with interactive design to help the users focusing on the data they are looking for. We also advocated for a preset of charts relative to what needs to be emphasized. Leading, good (in the center) and bad (sides) examples, in the "The Principles of Design: Readable Typography" article by Kjell Reigstad, Designer at Automattic. Users become frustrated when they lose the power of the action they are performing. Under the term control feedback, it is known to have a negative impact on their engagement as well as their overall performance, and evaluation of an interface. 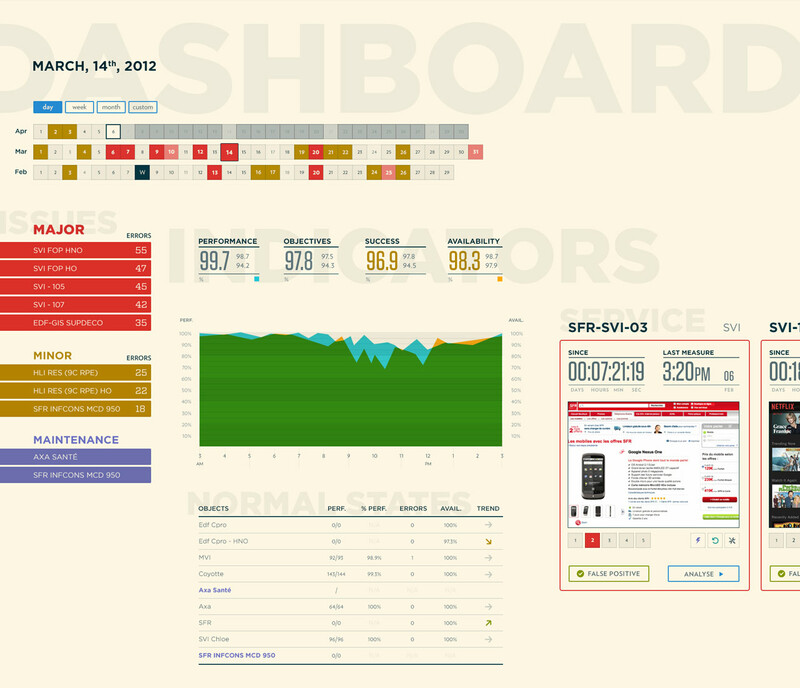 A dashboard is not only a report: it is a tool that provides a comprehensive view. It has to let the user decide if he wants to disclose at the full extent. That is the reason why we decided to display a horizontal global to detailed drilldown. 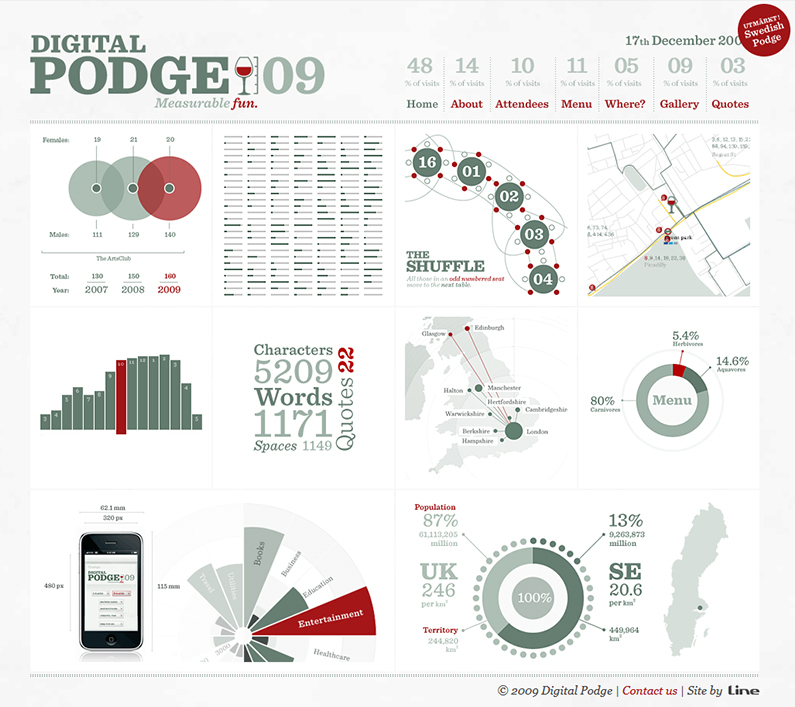 In 2012, everybody talks about big data, data mining, and data visualization. Cloud computing and open source data enable exponential possibilties. Witbe, leader of the market in France and Europe, has 5 main competitors: IP Label, Captain Dash, Cyfe, Dataiku, and Hadoop by IBM. Witbe is open to Data Scientists and Developers (like IP Label, Dataiku, and Hadoop), but also to CEOs. They want to break the "only engineer" access that comes with big data. It is one of their strengths in their market. However, like 4 of their competitors, they strongly rely on tables, and on a preset chart and colors to display data. Unlike the rest of their competitors, they are still not mobile-friendly (80% of the market) and they don't let their users build the dashboard on the go (67% of the market). Nonetheless, their expertise in coding analytics robots easily outweights the competitors. Highlights of the market analysis regarding big data, and analysis competitors, such as: IP Label, Captain Dash, Cyfe, Dataiku, and Hadoop by IBM. Reviews the dashboard every morning when entering his office. Looks at it every once in a while. Just wants to be reassured he is paying for a service that works. Logs in, and reviews the dashboard. A tool for accessing detailed and raw data when needed. When and where dit this issue occur? Develops scripts for traffic, bandwith, and user experience monitoring all day long. He tries to come home early to take care of his wife and child. Logs in multiple clients’ account to overview metrics. A tool for monitoring his robots’ metrics and gathering feedbacks. What is the name of the server of this object again? Spends his work day to fix issues found on servers. He is a hard worker and comes home only when all the bugs have been fixed. Connects to multiple servers to identify bugs and to perform tests. A tool for gathering all servers' bugs in one place. Can I have access to the root of this server? I need to test the robots! Users have access to the same data, but with different angles. They can interact with it, and analyze in great detail the issues that have happened. 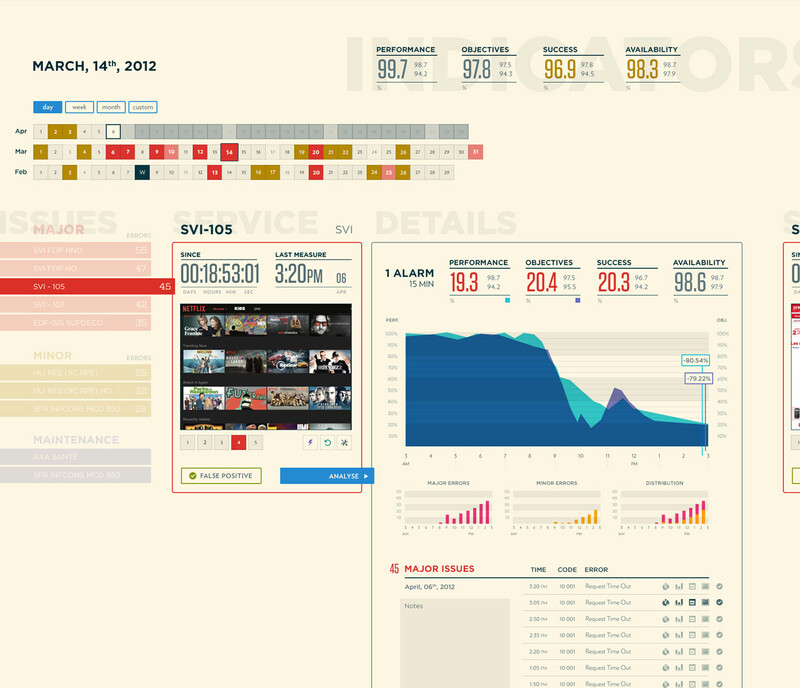 Here are the different views of the dashboard. It can be unorthodox to ban green as a "everything is alright" color. Yet, after testing with users, it appears that keeping it creates more confusion. Indeed, users need to be able to instantly spot where are the issues. However, green has been kept for only two actions: dismissing a false positive, and checking an issue as resolved. We also came up with the idea of displaying a horizontal calendar for the last 3 months: it helps users to spot recurring patterns, and to react accordingly. In order to support data visualization and give a sense of reporting, we used Gotham font family for headings, and body text, and call to action, Verlag family for annotations and legends. Numbers are displayed in Tungsten Medium for reporting, Vitesse Medium for errors. All fonts have been created by Hoeffler and Frere Jones, for Typography.com. Gotham is a sans serif typeface, inspired by a form of architectural signage that achieved popularity in the mid-twentieth century, especially throughout New York City. It has been commisioned by GQ magazine. Their editors wanted to display a typeface with a "geometric structure" that would look "masculine, new, and fresh". GQ agreed that they needed something "that was going to be very fresh and very established to have a sort of credible voice to it," according to Jonathan Hoefler.